At Engage R+D, we believe in intentional approaches that consider the needs of multiple participants. We often work with clients to design responsive convening experiences that facilitate learning and engagement. Our work with the David and Lucile Packard Foundation’s Informal Care Strategy grantees provides an example of how we’ve done this. In the spring of 2018, we worked with the Foundation to bring together their informal/Family Friend and Neighbor (FFN) care grantees, along with additional partners and stakeholders throughout California. An informal/FFN caregiver is any adult who cares for a child but is unlicensed, or license-exempt, and may receive pay or barter for equivalent services. Although informal/FFN care is widely used (80 percent of infants and toddlers in California are cared for by informal caregivers), little is known about the quality of informal care settings or which strategies best support FFN caregivers. The Packard Foundation is one of very few funders exploring ways to support diverse communities in this important aspect of young children’s care. From the Packard Foundation’s perspective, their main goal was to learn more about their grantees while also supporting cross-grantee learning. They were interested in understanding things like who from each organization worked on funded projects, how projects were implemented, and what people were learning about supporting informal/FFN caregivers. Instead of the typical site visits, grantee reports, and phone and email touchpoints, grantees would be brought together in person to share and discuss their work among peers. Grantees were busy nonprofit organizations serving the diverse needs of their communities. Many did not have the time and resources to learn about what others in their field are doing, or even to pause and reflect on their own work. For them, a major goal was to create time and space to hear from each other about what they were doing and learning and, in the process, to also reflect on their own work. We took time to interview each of the grantees to find out what they most wanted to get out of the day. Since research and published information in the field of informal/FFN care is still sparse and new, we also recognized the opportunity to organize discussions in a way that would surface learnings of broader relevance to the field. Placing grantees’ work in the broader context and enabling participants to contribute their insights was a major goal. It is a rare opportunity for these community grantees to come together to exclusively focus on informal/FFN care, as well as to hear from a nationally recognized expert from the field. We also felt it was important to set the context for the day’s discussions. The Packard Foundation invited Toni Porter, a nationally recognized expert in early care and education, to be the guest speaker. In her animated presentation, she painted the big picture by talking about current statistics, research, policy, and the status of what is known and unknown about the best way to reach and support caregivers. The Gallery Walk was the key activity of the day. Prior to the convening, we gathered information from grantees about their Packard-funded projects. We used their responses to develop large posters describing the work of each organization. To minimize burden on grantees, we designed and printed the posters and displayed them in the room, gallery style. 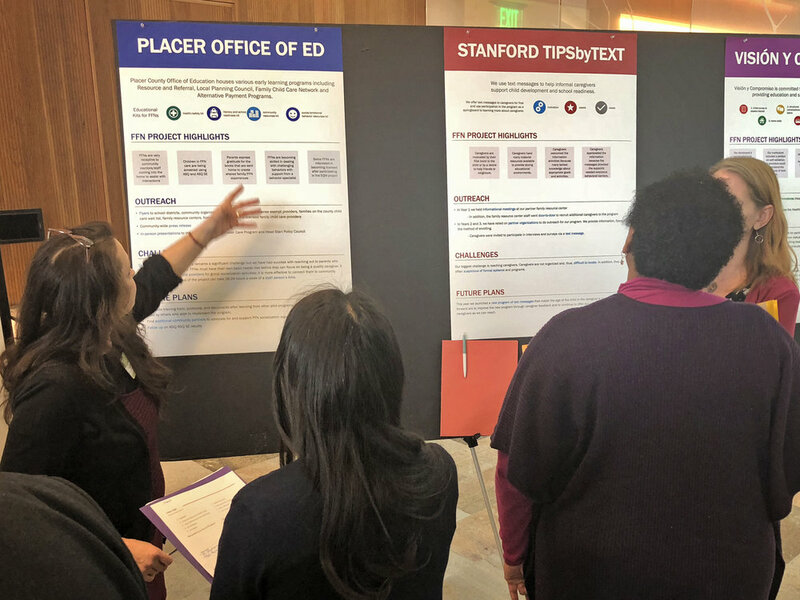 A representative from each grantee organization “hosted” their poster as all attendees viewed each one and had opportunities to ask questions. We also provided a form with guiding questions for everyone to have notes to take back with them. This activity ended with a full group discussion and debriefing. Prior to the convening, the interviews our team did with grantees revealed that, in addition to learning what others were doing to engage FFN caregivers, they also wanted to know how others were addressing key challenges. Based on the interviews, we identified and articulated three common challenges, asked grantees to provide real-life examples of these, and then created space for attendees to discuss and generate solutions. This activity resulted in a list of solutions that we shared with attendees following the convening. Overall, the day was received very well. Attendees were very engaged, not only with the activities but also with each other. 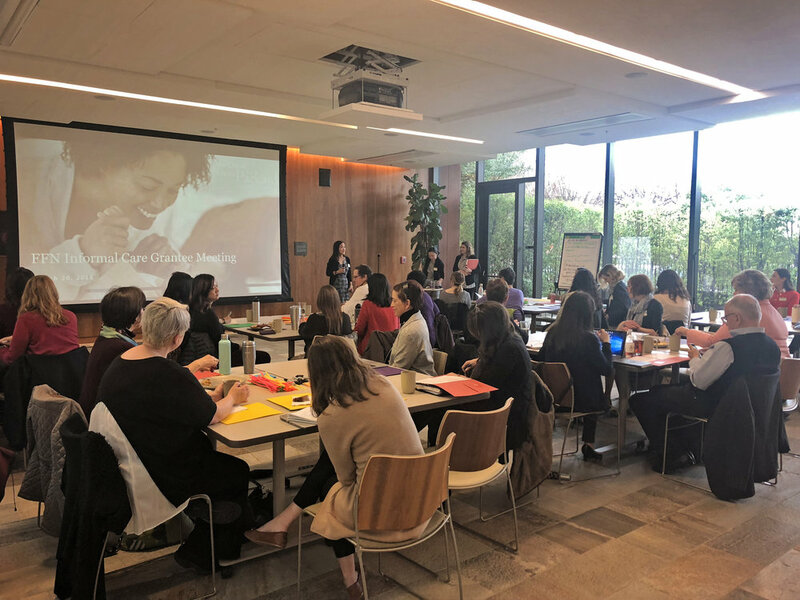 Packard Foundation staff had the opportunity to engage with grantees and partner organizations, while grantees had the opportunity to actively network with each other. Based on the evaluation of the day, attendees described the day as “inspiring,” “informative” and “connected.” They also reported that they learned from each other and collectively. The Foundation shared its own perspectives on the day, and insights from this discussion have been shared through presentations to the National Women’s Law Center, among others. We also plan to continue working with the Foundation and this group of grantees to organize and facilitate an ongoing learning community with more topic-focused webinars and another convening. As the Packard Foundation’s primary evaluation and learning partner for their Informal Strategy, we have seen firsthand how critical convening is as a strategy for developing new approaches, identifying promising practices, and scaling what works. Bringing nonprofits working on similar issues across different communities together and placing their work in the context of a broader field looking for new solutions has great potential to accelerate the spread of good ideas.